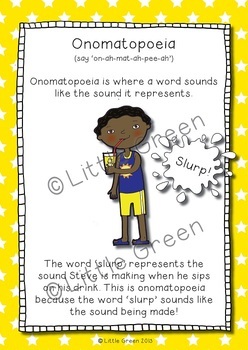 Looking for a resource to help you teach onomatopoeia? 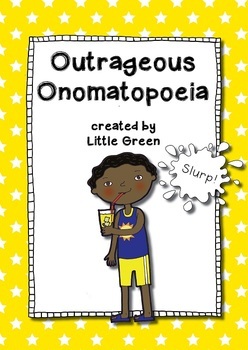 This pack is sure to help your students get on track with onomatopoeia by giving them opportunities to identify onomatopoeia at the sentence level as well as in authentic texts. Students will also have the opportunity to reflect on the effect of onomatopoeia and consider its purpose in literature. Your PDF download includes a full-colour poster to print and three black and white worksheets for easy printing and copying. An answer key is provided for each worksheet. 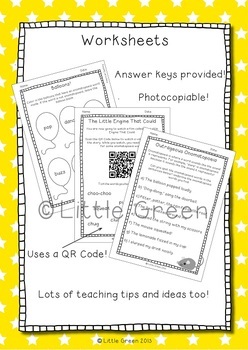 The pack also includes instructions on using QR Codes (to support the use of one of the worksheets). There are teaching tips to go along with each worksheet that will help you develop the right sequence of activities for your class. This resource has been aligned to the USA Common Core for Grade 1, the Australian Curriculum for Years 2-3 and the New South Wales Curriculum for Stage 1. A page outlining the curriculum standards supported by this resource is included in your download. Purchasing this item entitles you to print as many copies as you need for your own classroom use, but does not entitle you to distribute the digital file or prints to other teachers. If your colleagues would like their own copy, please purchase additional licenses or direct them to this page to purchase their own set. If you decide to download this resource, I'd appreciate you taking a few moments to leave a rating and a short comment. This feedback lets me know which resources you find most useful, which helps me make more of what you love! I appreciate your interest in my resources and would love to hear how you go using them with your students. PLEASE NOTE: You may have noticed my Australian spelling in this listing (e.g. 'colour' instead of 'color'). Not to worry - whenever a spelling variation affects a worksheet or printable in my products, I always include an American spelling version in the same download!